No Fish, No Pay! Guaranteed! The excitement of casting to tailing Red’s or throwing for Speckled Trout and flounder can’t be adequately described, it has to be experienced to be fully appreciated! Let me put 30 years of experience to work for you making your day as great as possible. Fish from my new 2017 Dargle bay boat. 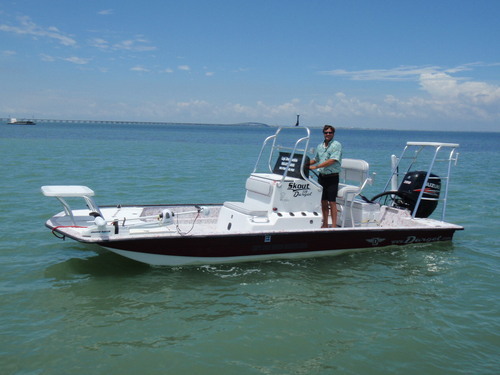 It can accommodate up to 5 with comfort and still navigate our shallow bay which averages only 3 feet in depth. A true jewel of the Texas coast, our undeveloped back bays are a must see for any island visitor. Catch fish guaranteed or no pay, see dolphin wildlife and fish up close and much more. We can accommodate friends, families from expert to novice and kids are always welcome on my boat. All Tackle, bait and fish preparation is included in the price. Those 17 or older need a fishing license and you should bring Sun Glasses, drinks, snacks and suntan lotion for your trip. A cooler for your fillets is also a good idea should you desire to keep fish.